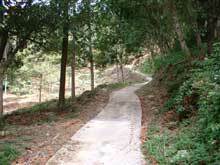 The cement road leading to the orchard. The current width is wide enough for a car. This cement road rises gently all the way to the subject property except for one or two spots which is slightly steep for a non-4-wheel-drive vehicle. This is entrance to the land. 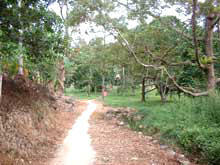 On the right of the cement road is a steam which is never without water even during dry season. The water is crystal clear. 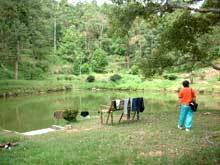 This is the first fresh water fish pond near the entrance to the land. The water from this pond comes from a underground spring water source further up the land. The semi-permanent house which is situated right of the first fish pond. Here the workers are busy sorting the durians for transport out to the town for sale. 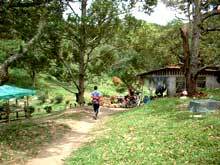 Most of the durians are of the kampong or seed variety.